Experiential Retail is a strategy used in the retail landscape to increase engagement, interest, and traffic in physical retail locations. It provides an opportunity for brands to connect in one-on-one interactions with their customers. Theoretically, these interactions happen in an environment where happy and powerful memories are being made. While the experience can take many forms, experiential retail usually includes some sensory, educational, and communal experiences with emotional connotations. So, through your experience-driven retail strategy, the brand becomes consciously or unconsciously associated with those powerful memories (recall). 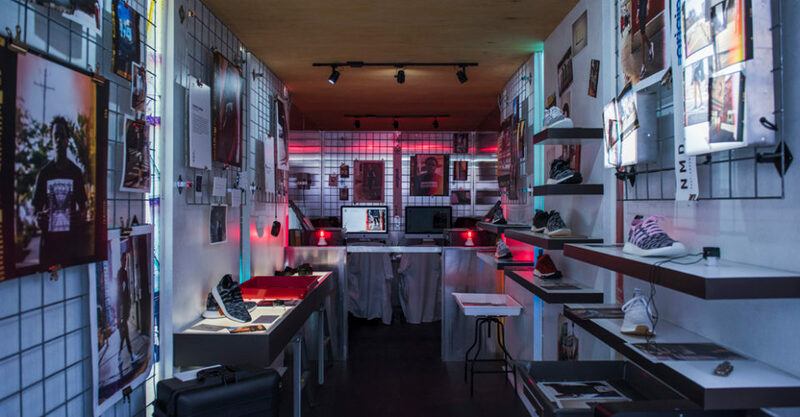 Experiential retail is becoming so popular because of the power it has to touch customers and motivate a specific set of behaviors. And if you want to talk about motivation and behavior, Maslow’s Hierarchy of Needs is a perfect model to flesh out the effective elements of retail experiences. Understanding Maslow’s Hierarchy of Needs helps develop sustainable retail experiences that motivate behavior. 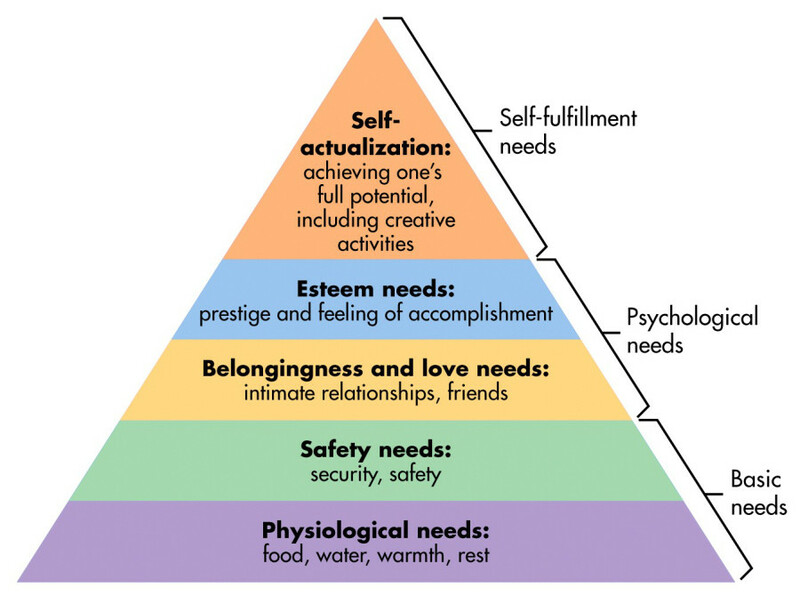 Taking a quick trip back to high school psychology, Maslow’s hierarchy of needs describes a theory of human motivation. We are motivated by needs encoded in our biology. Some take priority over others (this will become obvious as I elaborate). Once we fulfill one level we move to the next, each new level more difficult to master than the last. You’ll use the model to outline customer’s unconscious needs and how you may use those needs to develop meaningful connections and experiences that are tied directly to your brand. Although physiological and safety needs are two different rungs of the hierarchy, they are both associated with our basic survival needs. It’s important to consider these elements when planning a retail experience, but that isn’t really why we’re here. No experiential retail, even the most amazing, will trump a person’s need for survival. So, rather than making sure that you fulfill these needs, we’ll explore how you may employ an understanding to provide your customers with more holistic experiences. Our Physiological needs are biological requirements for human survival, e.g. air, food, drink, shelter, clothing, and sleep. Hopefully, this isn’t coming as a big shock. If we really think about the implications of a customer’s physiological needs, it can be easier to design your retail experience from a place of empathy. Safety needs are protection from elements, security, order, law, stability and a freedom from fear. In the context of motivational psychology, the implications are obvious. Stay safe to stay alive. However, there are some key takeaways that we can use to empathize with a customer who may be feeling uncomfortable in a new place or unusual environment. Think about any time you’re hungry/ thirsty or feel threatened/ intimidated. It can be difficult to focus on what’s around you. Your only thoughts are centered around meeting your biological needs. At this base level, nothing is more important than the food, water, or the safety your body needs to survive. Even if your brain knows that there’s a supreme pizza waiting in your freezer, your body will force your mind to think only about that pizza until you ’re satiated. What are some sustainable examples of addressing a customer’s physiological needs? Ensure Water Dispenser/ Water Fountains are nearby if not located in your retail store. Include an area where light snacks (or more) may be purchased. Provide seating, for tired patrons. Offer shelter from the sun and inclement weather- no purchase necessary. Post community standards or rules of engagement. Customers don’t know what to do (or what not to do) if you don’t tell them. Experiential concepts are new and thus can be intimidating. It’s a great idea to include signage/ wayfinding to explain the experience, how to get the most of it, and how to share it with their friends. All your experiences should have an equitable design, guaranteeing your location is accessible to all kinds of people. ADA guidelines offer some direction for accessibility options, but the standards are not exhaustive. Provide a place where people from all walks of life are welcomed. After physiological and safety needs have been fulfilled, the third level of human motivation is socially anchored and involves feelings of belonging. If love and belonging is about people, then the next phase of Maslow’s hierarchy demands that you find a way to develop connections within your community. That’s where our idea of third placemaking comes in. Third Placemaking is the result of our foundation in marketing and architecture design theory. The concept is a marriage between third place (marketing) and placemaking (architecture). Combined, they describe how businesses and communities may create a physical space that empowers people to create a spiritual, emotional, and psychological connection; an experience. The third place is a marketing theory that suggests people spend most of their time in three places. The first, and obviously the most frequented is your home. The second is your work or office. The third place is something else altogether. Providing a community where love and social connection may be found is vital to this step. If your family is at home (first place), and your peers are at work (second place), then the third place will be where you may meet old friends and find new ones. Of course, third place usually manifests in a physical space, but the theory touches more on the feeling of the place, and the community it creates. Third place does not have to be a physical place, rather a spiritual, emotional, or mental space, which could have major implications for omnichannel efforts. Placemaking, on the other hand, is very much about the physical layout and design of a space. A quality place will be safe, connected, welcoming, and allow for authentic experiences (Sound familiar?). The architecture and design of a space require the proper physical form, mix of land uses and functions, and social opportunity. Simply, the physical space brings people physically together. Third Placemaking will be the paradigm by which retail and community become synonymous. So, employing these strategies in your experiential retail is imperative to the success of your community building. Stores are regulated, surveilled, and designed by companies for selling goods. Heat maps, sensors, and big data will all become more powerful and could drive a wedge between brands and their markets. When brands use technology as a catch-all experience, a push for community can feel contrived and manipulative. If we continue to look at space and commerce in the same way, retail stores won’t be sustainable as community gathering places. Therefore, experiential retail rejects the idea that retail shops are only for shopping. It kills the authenticity of your community. What are some sustainable examples of addressing a customer’s Love and Belonging needs? Design the store with a special area for group seating, centered around a discussion/ conversation point. Provide activities or games that require more than one person. Bring to life the interests and passions you customers share. Host meetup groups with relevant interests. Maslow classified esteem into two categories: esteem for oneself (dignity, achievement, mastery, independence) and the desire for reputation or respect from others (status, prestige). This is a tricky one for businesses to affect because esteem is a one-man game. It is not possible, nor should you try to help your customers build their self-esteem. You are not a professional and any direct action on your part could put someone’s mental health at risk. However, it is very possible and highly suggested that you consider ways that you might be able to passively support someone at this level of the hierarchy. It can be tempting to refer to self-help books and channel this experience into an opportunity for customers to “pamper,” “indulge,” or offer “treat yourself” days. This is a false understanding of esteem and shouldn’t be perpetuated or manipulated to make sales. Providing a sanctuary for self-love isn’t about treating yourself, it’s about gently encouraging growth and identifying and pursuing long-term values. Agency- Choosing to take responsibility for one’s own choices, responses, and actions. Everyone is in charge of themselves. Awareness- Having an understanding of one’s physical body in space, emotions, feelings, and thoughts in this present moment. Authenticity- Knowing what one actually wants without regard for others’ opinions, socioeconomic implications, or fear of missing out. Action- Making decisions for, committing to, and asking for the things one wants and needs as identified in the first three pillars. What are some sustainable examples of addressing a customer’s Esteem Needs? Provide educational experiences like pop-up classes or guest speakers. Teach something valuable that’s relevant to your scope of expertise. Hold exclusive events for frequent shoppers and community influencers. Offer relevant certifications or provide a meeting place for relevant certification services. These needs are based around realizing personal potential, self-fulfillment, seeking personal growth and peak experiences. It’s a desire “to become everything one is capable of becoming.” There are some characteristics of Self-Actualized people that are extremely important to the development of experiences. First, they self-accept and have a democratic worldview. This means they accept themselves and others as they are regardless of background, status, or socioeconomic and cultural factors. Second, they have a thoughtful sense of humor, meaning they bring light-hearted fun with them wherever they go. Third, they enjoy the journey, not just the destination. This has big implications for experiential retail. Self-actualized customers will be the biggest proponents of your retail experience because this group is most receptive to opportunities to wholeheartedly engage, rather than stick to a transactional interaction. Fourth (and the most exciting), self-actualized people have frequent peak experiences. Simpler terms: they frequently leave experiences feeling changed and transformed. And that’s the exact feeling all experiential retail is aiming to achieve. What are some sustainable examples of addressing a customer’s Self-Actualization Needs? Actively participate in something (read: a cause) bigger than your business. Work towards a greater purpose and bring your customers along for the ride. Thoughtfully consider how your brand can help people achieve everything they are capable of being. Through the entirety of the pyramid, we are looking for ways to help a customer feel transformed by the brand. Each action item listed grows into an ultimate experience that speaks to people on a deeply emotional and spiritual level. No VR headsets, no augmented reality, no apps, no expensive screens or complicated tech packages. Just you and them and the brand building a better world for each other, together. Bet they didn’t teach THAT in high school.